John Dorcey, Interim Director of SAFE (Society of Aviation and Flight Educators) joins us to talk about all things aviation education. With quite the impressive aviation background himself, John has a lot to offer in terms of aviation experience. Not only did he go through the motions of getting his PPL, Instrument, Commercial, CFI, MEI, and all that, but he also eventually got his A&P and IA. John worked in many different types of flying jobs, in addition to working for the State of Wisconsin in their Department of Transportation, overseeing the aviation department. 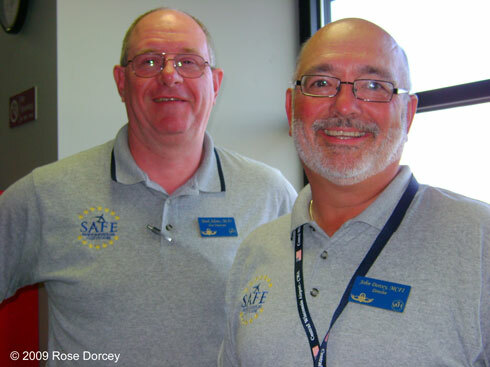 John is now interim director of SAFE, an organization that champions aviation education. SAFE offers a lot of support for those who consider themselves educators in the aviation community. CFI’s, K-12 teacher, ground school teachers, and others passionate about aviation improvement/education can get a lot of resources from SAFE. Don’t miss this easy flowing and fun conversation with John Dorcey. John, thanks for joining us on AviatorCast. Thanks for all you do for the education of current and future pilots! Keep up on the awesome work. Flying safe with S.A.F.E. This is AviatorCast episode 68! Chris: Welcome, welcome, welcome aviators, you’ve landed at AviatorCast. My name is Chris Palmer. There is a time in every aviator’s life when he or she finally catches the spark of aviation. For me, that happened as a teenager but didn’t truly start there. It started somewhere else earlier at a time I don’t recall when someone shared aviation with me. I believe it’s in all of us and a duty for all of us to share that spark with others. That spark that being an aviator is an unmatched freedom of mankind. So welcome to this, the 68th episode of AviatorCast. It is my absolute pleasure to welcome you here week after week to our great, great podcast. So AviatorCast is a weekly podcast where we have inspiring interviews with aviators around the world. We have insight into the aviation industry or into training or something that can help you improve as an aviator. This may be a place for you to reignite the flame of aviation, reignite that passion that you may have got early on just like me, just like many of us with aviation, and maybe even getting the courage to fly. Maybe you have always wanted to be a pilot but you’re holding back because of financial or medical reasons or it just seems like this big daunting task. This is a place where we demystify those things, we share with you what really matters, that core aviator, that excitement, that passion, and we hope that you get some of those things from this show. On today’s episode, we have the perfect guest to talk about those sort of things. Today we are joined by John Dorcey of S.A.F.E. SAFE stands for Society of Aviation Flight Educators. These guys, this is an awesome organization. I’m part of it. We’re definitely going to talk more about who they are, and John, wow, what a background. I can’t wait for you guys to hear about his aviation background. It’s pretty amazing. So as always, before we get to the meat and potatoes of the show, we have a review that comes to us from iTunes. Just as a reminder, if you leave a review on iTunes, you will get a free AviatorCast t-shirt. So this person that has left review here, I’m about to read it, and make sure you email me and I will make sure to send you off an AviatorCast t-shirt. So I’m glad we know your name now Glen, not just NZAircraftFan. So Glen, thank you for leaving that review. Really appreciate it. Really happy to know that AviatorCast is coming all the way to us from Middle Earth. Gosh, I just love Lord of the Rings, I’m sorry I keep saying that. But Glen, thanks so much. An AviatorCast t-shirt is coming your way. Send me an email, me@aviatorcast.com and I will make sure to send you that t-shirt. So, I’m excited for this interview here with John Dorcey. We’re going to get right into it. I think you guys will enjoy it. This guy has a pretty, he has a lot of background in aviation, lot of things that I actually didn’t expect but very cool. There’s just something about people that are lifelong aviation educators that I really connect with and really appreciate it. They are truly the people in aviation that keep us going. So, here it is, here is hangar talk with John Dorcey. Chris: Alright everybody, we are honored to have a very special guest with us today, John Dorcey from SAFE. Thanks for joining us on AviatorCast John. How you doing? John: Chris, thanks for having me. We’re doing great today. I do want to say of course that I’m one of those folks that are fortunate to live in Oshkosh, Wisconsin, home of AirVenture, and it’s kind of like Las Vegas. When people hear that I live in Oshkosh, it’s like people really live there so I’m kind of glad to hear that. Chris: The population doesn’t just triple suddenly every year at Oshkosh. Yeah, people actually live there. I was actually looking at my tickets for Oshkosh today and a rental car and all sorts of things, so we’re getting pretty close now. It’s getting exciting. John: It is getting exciting, and the clock is ticking and I think we’re down to somewhere around 47, 46 days. So yep, we’re getting close. Chris: Goodness. I need some sort of ticker on my desktop or something here that tells me how long. Should be a fun time. So it’s great to have you on the today. I am very excited about the organization that you’re involved in. Can you tell us just briefly the elevator pitch of who you are the interim director for right now. John: Sure Chris, and the organization is called SAFE, the Society of Aviation and Flight Educators. We’re a rather young organization, we began in April of 2009, and what we really are is an organization for all aviation educators, and we want to make sure that that this known right out from the get-go. It’s not a flight instructor group. It’s not just a ground instructor group. What we really are is an audience of everybody that does any kind of instruction and I contend Chris that if you and I were to meet and let’s say that I’m a private pilot and you’re a friend of mine who has never been up in an airplane before and I give you that first flight experience, I am really an aviation educator. I am sharing with you my passion for this thing we call aviation. And so that makes me an educator and by virtue of that then, you’re a great candidate for SAFE. We see it as a continuum of education opportunities for folks. Our vision is promoting excellence in aviation education and really what we wanted to do in life is just create a safer aviation environment. We do that a lot of different ways and the first thing of course is to support aviation educators and we do that mentoring and educational resources, lots of benefits for our members. We also have an accreditation program for flight and ground instructors currently. We’re hoping to expand that into other forms of aviation education as well. We are also a big promoter of lifelong learning in that once we get involved with aviation, whether we’re just an advocate or a mechanic or an airline captain, all of us are always learning something, and that’s what we’re all about. Chris: Great. And for the listeners of the show, they know that I myself, I am very passionate about aviation education, about approaching things maybe a little bit differently and that’s a big reason why this podcast even exist. And from the flight instructor perspective or the ground instructor perspective or even the educator perspective, say K-12, whatever it is or even in college level, they don’t necessarily look to a podcast as an area of I guess education. But I’m actually a member of SAFE. Coincidentally enough, I signed up last year when I was at Oshkosh with a little bit of more backstory and maybe I’ll talk about this more later, we’ll keep it brief for now, but when I was first looking to start this podcast, I was trying to gain the inspiration for it, I was getting really excited about this idea, and I’m the sort of person that when I commit to something, I’m going to commit to it for the long haul and so I wanted to make sure that I was really getting to the bottom of why I was doing podcast and why it mattered, and I ended up running across a bunch of videos that were posted to Vimeo that were from the original kind of kickoff conference that SAFE had, and I think it was in Atlanta or something like that. It actually really inspired me to in a big way start this podcast and kind of do my part, so there’s kind of a connection there that definitely works out. 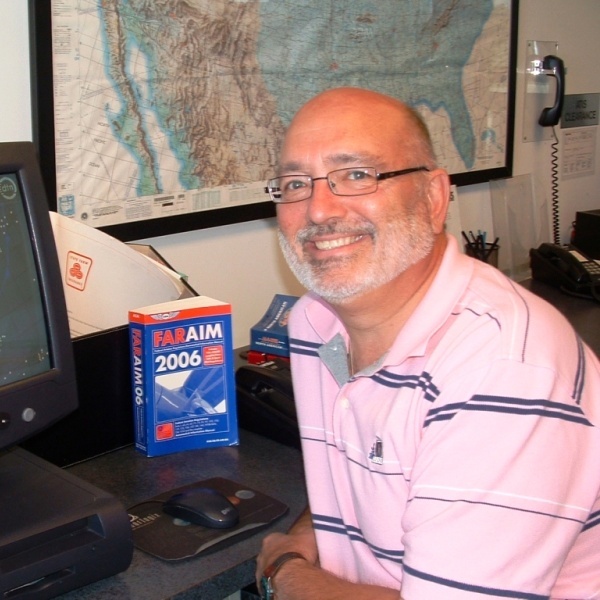 John: There certainly is, and I think that the, you know it’s interesting when you mentioned the podcast because as a flight instructor for a lot of years, in fact, I’m now in my 42nd year of teaching as a CFI, we didn’t have such things. We had a book. That was the style of teaching back then. We would make sure that we wrote using the same text, the instructor and the student, and we’d move forward from that. There wasn’t the depth and breadth of all kinds of trainings that we’ve got today, and it’s incumbent upon, talking about this life-long learning, it’s incumbent upon educators to make sure that they’re using appropriate tool for each and every student. Podcast aren’t going to maybe work for a 70-year-old or an 80-year-old but on the other hand, that 17-year-old is thinking why not? Why aren’t you using a podcast or an online video or fill in the blanks. That’s another thing that’s so important I think for educators, is to keep up with all the various methods and means that we have available to us. Chris: Definitely. Great. So that’s a good introduction synopsis to kind of what you’re doing today. Really the first question we usually get to on this show is how did you fall in love with aviation? Where did it all start? I won’t make you reveal how long ago that was but we’d love to hear you beginning story. And I’ve been very, very blessed to be able to do exactly that ever since. So from the tender age of 8, we were getting started in the space program and I became the raucous reader of anything that spoke of space and our astronaut programs and all kind of things, and it was just a natural outgrowth. I never really did model airplanes like the World War II guys did and hang them in the bedroom, but I did make a lot of model rockets back in the day. The Estes company had a lot of their product in my bedroom. So it was kind of a modern day version or a version number two of that same modeling thing. Then I entered the air force. Well, I guess I should back up and let you know that my dad did get his pilot certificate, so I’m a second generation pilot. Chris: So wait, did you jump straight from being eight years old to being in the air force. Let’s make sure we close that gap too. We do want to hear about your dad as well. John: Well, he did get his private certificate and bought a number of airplanes by the time I graduated from high school. I really had that passion cemented. So now I’m not just building model rockets and launching them off the school lot but I’m going for rides with my dad and it gave us an opportunity to bond. So then, I get out of high school and the Vietnam conflict was running rather rampant. I decided that I really wanted to go into the air force, and I went into missile maintenance which probably is not a surprise considering again those Estes rockets. I worked on a missile that went on the B-52. So this year’s AirVenture is going to have a real attraction for me. I was actually part of the teams that would load the missile on the aircraft so I did most of my time in the service in Grand Forks North Dakota working outside on this missile that went on the B-52. So I did that, got out of the service but while I was in the service and after I reenlisted, I had the opportunity to use the GI bill. And so I added to my private certificate with all the ratings. I got out of the service after a little over six years with commercial CFI, instrument, multi, all those things, and 700 hours. And this was in a time when the airlines were really slowing down and things were getting a little tougher, and I had a written a letter to the chief pilot at a company called Johnson Wax in Racine, Wisconsin. They had a flight department then, they still do, and of course I figured that of course they would snap me up 700 hours. Oh my gosh. Who wouldn’t want to snap up 700 hours? But the reality of it was was the chief pilot whose last name is coincidentally Dorcey gave me the best piece of advice I’ve ever gotten Chris in aviation, and that was if I really wanted to be a career pilot, what I really should consider doing is to add my AMP. And in my hometown, there was a two-year community college with an AMP program. So I get out of the service and two years later, I’ve added the AMP as well as the instrument instructor. And while I was in school, I was teaching a lot of my classmates to fly. So they were my classmates during the day and my students at night. So I was able to add about 600 hours of flight time during that two years. All of it dual given and a lot of new pilots because of that. So they were doing the same thing I was doing, just in a slightly different order. They had gotten their AMP or at least started work on the AMP and then started the flight training. So at the end of all that, I ended up with a number of additional credentials. I went on to fly for a corporation just in Rockford, Illinois, flew a DC-3 as a corporate, not cargo but strictly a people hauler. It was originally it was a United airplane. So I did that for about five years, learned a lot about all kinds of weather and of course the 3 is an aircraft that you’re flying at the altitudes where you’re in the worst here in the Midwest, 6,000 to 11,000 feet normally and that’s where it is all happening. We didn’t have radar in the airplane, we didn’t have an autopilot so it was a lot of real stick and rudder work. And again, learned a lot about flying with that. While I was doing that though, I was also doing, again there’s this passion thing, I was doing a lot of flight instructing on weekends and doing those kinds of things and I had an opportunity to do a lot of older airplane since my dad had a J-3 and I was able to fly a lot of tail aircraft and early Aeroncas, Chiefs, Champs. So I really got a real good education in small airplanes and tailwheel airplanes. I moved from the DC-3 actually to fly cargo and I was doing that in a Twin Beech model 18, and then that component was also a charter outfit so we were adding another airplane. So I was flying people and boxes. Chris: And where did you fly those Beech-18s? John: Yeah, it was strictly out of Southern Wisconsin. There was a GM assembly plant in my hometown so we did a lot of GM Freight that would take us as far east as Pennsylvania and not too far west, mostly in what we would call the Rust Belt today. So from St. Louis and Illinois, Indiana, Ohio, Michigan, Pennsylvania. I occasionally get out to Delaware. We had a contract with some folks out there. So it was mostly through the central part of the country. It was again a nice opportunity, round engines, tailwheel. I thought that was the only kind of airplanes that were there, was the round engines and tailwheel. I often thought that I maybe have been born too late because most of those airplanes were falling by the wayside, so I kind of got in on the tail end of that and I really enjoyed that. But then my charter company moved on to bigger airplanes. We were flying Cheyennes and eventually some King Airs. So I got a real good mix. Chris: I’m having a hard time keeping up. I have to be honest. I mean, this is crazy how many different experiences you’ve had, because this is, it’s a pretty varietous experience that a lot of people actually haven’t had. I mean gosh, I’ve flown probably 10 different airplane models and that’s about it. This is crazy. John: Well I think, and when people ask about careers and things, I always go back to that piece of advice that the J-Wax chief pilot had said, was get that mechanics certificate, and I really do feel that we don’t have to be a mechanic to take advantage of some things but now we’re talking the mid-70s to the mid-80s. A lot of that was being in the right place at the right time. A lot of it was just the fact that it was some real go-go years in aviation. I mean, everything was picking up. There was a lot of growth in aircraft, there was a lot of growth in pilot numbers. So there was a lot of opportunities. And a lot of it again was like I said being in the right place at the right time, but also with the right credentials. So they go flying in the Beechcraft, and he says “Why don’t you finish your multiengine training with me and we’ll start you flying for the company next week.” He gets his multiengine certificate, maybe an Aztec, Apache were still active then, maybe a Seneca which would’ve been almost a brand new airplane then, and literally the ink was still wet on his multiengine certificate when he becomes a right-seater in this 125. Now, that’s the kind of events that again are being the stars to line up. But the right credentials, and the right place at the right time. And of course there’s a lot to knowing the right people. Aviation though is such a small industry. It’s such a small community. You can’t help but know. You and I have had an opportunity to sit down across from each other at a table and we haven’t talked about people that we know, but I would dare say Chris that like most aviators, we can drop one or two names and there will surely be “Oh yeah, I know Bob or Bill or whomever and in fact I went for an airplane ride with Omer, I worked on his airplane” or in your case maybe wrote a website for him or something. But that’s how small of a community we are and how tight-knit. So that’s why I think, and again it was kind of go-go times then in the mid-80s where those opportunities came up for a lot of folks. John: Well, you know, I liken it to the idea of a private pilot getting the instrument rating. Maybe she’s never going to fly in instrument conditions or not in hard instrument conditions, maybe fly through a medium level deck, get on top and fly to a VFR conditions to her destination but she’s a much better pilot for having the instrument rating. My point with that is I think that you and any other pilot that gets their AMP or even repair certificate is going to be a better pilot. You’re going to know your systems much better. You’re going to just be a more knowledgeable, more, I don’t want to say safer pilot but truly you will be a safer pilot because you’re going to look at everything with a slightly different set of eyes and that’s a good thing. Chris: Yeah. You know, it brings me back to my first instructor and I went to a Part-141 University for my private and it reminds me of him because he was an instructor, I was one of his first students that he’d ever have, but he was also an AMP mechanic there at the college, you know, a younger guy, like he had recently gotten his AMP and recently gotten his CFI, and he was really sharp for his experience just looking back and knowing of the things that he taught me early on and knowing how he reacted to certain situations versus what other instructors did. I look back and realize that he was one of the wisest pilots that I ever flew with. But just on the surface credential-wise, at least if you’re not taking into the account of the AMP which is what I’m trying to get at here. I was one of his first students. I was like hi third student that he had ever had, and he only got the other guys a couple weeks before me. On surface level, he wasn’t a prodigy or anything but now that we’re talking about this, it has to be largely attributed to the fact that he was doing that AMP and doing those sort of things because to this day, he is one of my aviation heroes if you will. John: Sure. And I think that there are lots of, again there are lots of avenues to take. It’s not necessarily just the AMP. And again, there is some applicability, not perfect crossover, but a person with some real mechanical skills whether they’re an automechanic or maybe a truck mechanic, maybe they’re a heavy equipment operator. I’m going to guess that in Alaska, you got a lot of folks who make a living as heavy equipment operators. And those folks bring a whole new set of skills and it’s that tactual feel from their fingertips, their toetips of moving the controls of whatever piece of equipment that they’re operating. Even farmers, with their equipment that they’re operating, again are bringing another set of skills to the flight training. So we all bring those kinds of things. It brings a real challenge to a flight instructor because of course we have to be able to apply not only what they know if can be applicable but to also make sure that there isn’t a negative transfer. For example, we all know that first flight where you’re taxiing and you come to a T-intersection and you want to take the controls and move it left or right, and of course the airplane is going to keep right angle and right across the edge of the taxiway if the instructor doesn’t interrupt that, so a little negative transfer. But there’s a lot of positive things too. And through all of those, it’s that passion. I always contend that if that passion can overcome a lot of challenges and if you really want to do something and positive motivations, you’re going to be able to do it and overcome a lot of those adversity things that might stand in your way or anybody’s way in getting that certificate. Chris: Yeah definitely. On this show, we talk a lot about just variety. I mean, I’ve said it many times that aviation is about variety. And although we largely stay in the context of aviation for the variety, you know, if you haven’t landed on a grass strip or a gravel strip before, go and do that. If you haven’t got a float rating, go and try that out. Land on snow, land on a gravel bar or a sandbar on a river with the help of an instructor of course. Don’t do it for the first time by yourself. Those different things that just give us better perspective. Because you know for me, most of my hours were spent on hundred-foot wide runways and plenty of runway length and not a big deal, just going one place to the other in pretty nice airplanes, but going in and starting and getting my float rating, and I don’t have it quite yet but working on that, it’s really opened to my eyes to how the wind interacts with the airplane. It’s just kind of this new perspective that gosh, when you’re sitting on the water and the wind can do what it wants to you and kind of push you around, you learn a lot about how the wind affects an airplane. John: Sure, and as I was saying, because of that experience, you’re going to be a much better crosswind pilot just because you’re cognizant of the fact that that wind, we can’t see it, but boy it’s having an effect on you and your airplane everytime you’re sitting in the aircraft. Chris: Yep. Everywhere, every altitude. It’s always there doing something. And if it’s not in the float plane and you have glassy water, well then you have a different problem so that’s another thing. John: Exactly right. Now you’re almost wishing you did have a little bit of wind to keep those ripples going. So I went from flying charter and corporate and doing some flight instructor at 141 school and I was the chief instructor for that, and all of those things all at the same and then in the mid-80s, the air traffic controller strike happened and I applied for a position as an air traffic controller. A couple of the folks that I interviewed with were a little nervous. One of them I knew personally because he was afraid that as a flight instructor I’d be, then as a controller, I might want to be climbing into the cockpit with the pilots. That said though, they still gave me a nod and I had actually gotten a class A tickets to go to Oklahoma City. At the same time, I had applied for a job with the Wisconsin Department of Transportation. They were looking for an aviation consultant which was really going to be the position. I had a number of responsibilities but included the chief pilot for all the pilots I flew for the DOT and there are at that time about 24 or 25, as well as I would go around and do safety seminars. There were live presentations three nights a week for about a dozen weeks in the fall. We would do that with an FAA FSDO rap. And so amazingly, I got the interview and got accepted for the state job and offer the Friday before, I was supposed to leave for Oklahoma City on the next Monday. So needless to say, I had some real deep discussions with my family about which way we were going to go and as it turned out, I stayed in Wisconsin, went to work in the capital and stayed there for a little over 22 years. And did, as I said, the aviation safety seminars. 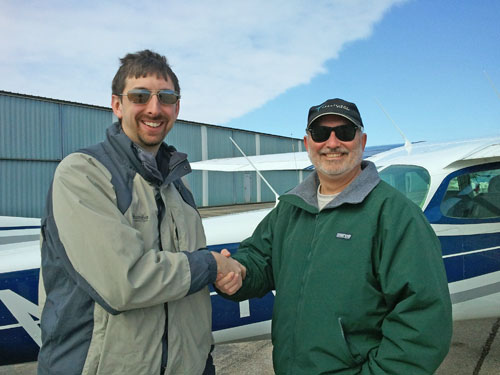 We did flight instructor refresher courses. We do two or three of those a year, about 100 flight instructors at each course. We would do IA renewals and I was able to get my IA then as well. I thought it is only appropriate if I’m recertifying these guys, I should hold the certificate so I can know a little bit more about what they’re going through. So I was able to do that and then at the very end of my career, we moved into airport compliance. Wisconsin airports are funded with what’s called a Block Grant Program where the federal government rather than the moneys coming to the airports for their development from Washington, they would come to the state first. And we would then determine which airports needed the money more than maybe their neighbor down the road. Our argument was that who better than the local folks would know better than somebody in Washington who probably doesn’t even know how to pronounce some of the city names in Wisconsin. Chris: Yeah, they get a little weird. John: They get a lot weird, yes. So for the last 5 or 6 years of my career then at the state, I was a compliance guy, making sure that the airport owners, that would be the city government or the county government, when they get federal funds, they have to promise that they will adhere to 39 rules, they’re pretty specific rules. And that promise is good for 20 years. So I would go around, and really what I was there for is to make sure that we didn’t have the airport run into problems the sponsor. We’ve heard some of the horror stories of airports that have misguided some of their funds and done things that are maybe a little bit, a little sketchy I guess, and so my job is to make sure that those things didn’t happen or if they did, then maybe was purely by accident, that we could get them back on the road to recover and doing the right things again. So then my wife had an opportunity to get a job EAA as an editor in their magazine division, and that was about a two-hour drive to my job. And I said, “Oh commuting would be pretty expensive so why don’t I just retire?” She said “No, no, no. I’m not going to take a new job for you to retire.” So I said “Well let me look around and we’ll see what we can do.” And about that time, regional airport was looking for an operations manager at the airport and it was in the same retirement system so I just one day moved from Madison to Oshkosh and went to work on Monday and it was just like the same situation, the same healthcare and all that kind of stuff. So I did that from 2007 until just after AirVenture 2012, and then I was able to retire. And I still flight instruct. I’m doing a lot of teaching. I got a flying club that were very active with. My wife is a pilot. She’ s just about commercial but she’s a private instrument right now and working towards maybe getting that tailwheel endorsement as well. So yeah, we’re a real aviation family. Chris: Great. I have some other questions that I thought of while you were giving your spiel there before we get into kind of the next phase. The first of just kind of many questions here is do you have an aviation hero that kind of pops out as someone that really helped you in your career? John: Well, you know, yeah, that’s a really great question and it was made more poignant, more significant Chris when you said helped me in my career. One thing that I do currently besides being executive director for SAFE is I have been a longtime member of the board for an organization called the Wisconsin Aviation Hall of Fame, and we recognize a lot of heroes in aviation, and a lot of them are heroes not just because of their aviation work in Wisconsin but across the country and around the world really for a lot of those folks. Some names that podcast listeners are going to recognize right away, Paul Poberezny, Tom Poberezny, Steve Wittman, and then some lesser known folks, but I actually just finished a tour of telling a story of Richard Bong who is the ace of aces World War II, had 40 victories in the South Pacific. Grew up on a little tiny farm in Northwestern Wisconsin outside of Superior, and just an interesting story. Now, last Saturday, I was at a high school graduation party for a young girl who graduated from a little town outside of Oshkosh who I worked with on her private certificate and last year while she was a junior, we summered between the junior and senior year. And mom and dad were just gushing over me saying “Oh my goodness John, you are the best flight instructor in the world. You’re just terrific, you’re great, you’re wonderful.” And so you see that circle, and that’s the reason I’ve been at that hero thing is that truly, we all have our heroes and eventually we might become a hero. And you don’t do it to become a hero, you’re just doing your job or your task, or you’re doing it because you’re passionate about a person or about aviation and you want to see them succeed too. And so I think that truthfully, like I think that all of us in aviation had an opportunity to be aviation educators, I think we all have the opportunity to be aviation heroes too. And a lot of us are heroes I think a lot more than we may even give ourselves credit for. Chris: Yeah, yeah. That’s interesting. You took that question a really great direction. I like that. Kind of doing your thing and giving back to the community, and for me, you know, I know that I give back to the community to a certain extent but I don’t do it for recognition, I don’t do it because some vain ambition or something. I do it because I am passionate about this and it keeps me going and it allows me to get to know people better and just be connected with the community better and that’s what I really draw out of it. And that’s what we all need to do to a certain extent. I mean, going back to your penny for pound first airplane ride, how many of us have the opportunity to do that sort of thing for a child in our life? A relative or maybe it’s the Boy Scouts or the Young Eagles of course do programs like that. There are so many opportunities to get people into aviation. Because if they are at heart an aviator, it does click to cash that bug. It’s something that everyone talks about. John: Absolutely. And it’s that one disease that we should all be happy to share. Chris: Exactly, yep. I love it. I’m not trying to cure it at all. I’m just trying to get deeper into it. So let’s open up the remainder of the time here because I definitely want to use this opportunity for you and for the SAFE organization to share a little bit about what they’re about and kind of the initiatives that you guys have, different things. And I do know some things about SAFE so I’ll try to guide the conversation if I even need to. I think you’ll be just fine yourself but why don’t we start there? So again, just a brief summary of again what SAFE is and then let’s get into some more detail about what SAFE does. John: Sure, excellent. Well as I said Chris, we started in April 2009 and we look to be an all-inclusive organization for all aviation educators. And we really look at aviation as a continuum, from grade school to college, from that first airplane ride experience to the most advance rating, we’re all on the same path. And what we want to be able to do is to, let’s say that there’s an 8-year-old boy in third grade and something sparks, maybe seeing something on the internet or something on television, he saw that just lit a fire and maybe mom and dad aren’t aviation people, and there’s no one in their circle that has any aviation connection. Well if that school teacher and that third grade teacher for that little guy knew of SAFE and took advantage of some of the resources that we provide and not just the members but there are more resources if you are a member, then we’d help that facilitation. We facilitated that whole to move from just a spark in his eye to who knows who he might be. Maybe he will be the first person to land on Mars with our expedition going there. The SAFE today, we’re about 1000 members. About 94% are flight ground instructors exclusively. The remaining 6% are kind of a mix of school teachers that may or may not be also a CFI. Maybe they’re just an aviation advocate and they understand the importance of continuing aviation education for the betterment of aviation. And so we continue to go out and again our mission is to enhance aviation safety, and we look at it as a couple of ways, and the number one thing of course is is if we provide aviation resources to our members, to non-members. We’re going to automatically raise the bar a little bit, and that raising the bar is going to make it safer for all of us. John: Then we’re going to again provide resources for all folks. We have a resource center that is, and if I can paint a word picture here, let’s consider being a library where it’s got two sets of doors. The first set of doors, the public can come in and can look through a number of materials that are available to them for free, no charge. There are curriculums for privates and instrument pilot training. There are all kinds of resources for K through 12 teachers. Again, all free, all open to the public straight through our website at Safepilots.org. And then you go a little further into the library, you get through that second set of double doors with a membership, and then there are more resources. There are powerpoint presentations, there are some videos and a lot of tools where an educator again is going to get better. They’re going to be able to use those tools to enhance their education opportunities. And that’s just our resource center. And again, those are opportunities for our members. We also have a free, we have a lot of member benefits, but one of them is an automatic subscription of Flying Magazine. We’re tickled that Flying Magazine thinks enough of what SAFE does to give all of our members a free subscription to fly. It’s wonderful and probably the flagship magazine of all aviation today for general aviation is Flying Magazine. So we’re very proud of that relationship that we have with Flying. We also have a quarterly magazine ourselves. It’s an online magazine. It’s available to members, and that’s actually backed up with a quarterly e-newsletter that goes out to anybody that’s interested, so if you visit our website, you can sign up to subscribe to our newsletter. And those things cover more general kinds of things, kind of what’s going on in the organization. We really look at this aviation education thing though as it takes a village. So it takes K-through-12 teachers. And why should, if you’re a private pilot listening to this podcast, what different does it make about your school teachers and your local community having aviation experience or resources. Well, if there’s an issue at the airport and a lot of folks are maybe coming out against it, if that teacher or group of teachers were talking about aviation concepts through their classes, those words are going to become a little more recognizing what’s important about aviation and they would become then advocates for the airport. Or they may even become influences on mom and dad about whether we should extend a runway or clear an approach or any of those kinds of things that just the day to day operations of the airport. So now what we’re going to be doing is getting little advocates if you will for aviation and they may never become a pilot, but they’re going to be a lot in tune to just what aviation is all about, and so many communities really do rely on aviation and whether it’s the medivac helicopter landing at the hospital or maybe some parts that came in to the tractor supply house that you needed to get your tractor fixed to get back into the field, all of those things and many many more are what we do everyday in aviation. So by keeping everyone attuned and aware of what’s going on, I think we become less adversarial. So again, it takes a community, it takes a village, K-12 teachers, all aviation people, college professors, it just continues to expand. And so what we look at SAFE is that we can’t do this alone. We need to work with other organizations and probably the best example of that and you’ve already addressed our early 2010 efforts in Atlanta but this year at AirVenture in OshKosh in July, we’re going to be involved with a number or organizations that are putting on a thing called the pilot proficiency center. And this is going to be free and it’s going involve both IFR and VFR pilots some of the other players involved are again this village concept that I mentioned. It’s going to be include Hartzell Propellers, IMC Clubs, Aircraft Spruce, Signature Flight Support, EAA, as well as NAFI, the National Association of Flight Instructors, so another aviation education group. We’re all going to be working together. We’re going to have a number of simulators from Redbird Simulation. We’re actually going to have six in an IFR simulator lab. We’re going to have six simulators in the VFR simulator lab. We’re going to be doing some live presentations called tech talks, there will be three of those each day. And the whole idea is to raise the bar on aviation safety. And all of these for free and it will be in a large chalet-type tent right on the flight line at AirVenture. So I really encourage your listeners Chris if they’re attending AirVenture to make sure they put aside some time to visit the pilot proficiency center right down on the stage show or the air show center and take advantage of some of these opportunities. SAFE is one of the partners involved with it and we’re happy that we were asked. There will be a total of 18 instructors a day involved, so there are lots of opportunities for folks to come in and talk, do some flight training, and expand their abilities and capabilities. Chris: Yeah, that sounds really fun. I plan on being there. There is a lot of stuff that goes on like that at Oshkosh and of course, you guys are definitely always trying to involve yourself on the educational stuff and if I can for a second just going back to the K-12 stuff, my mother, she’s a third grade teacher. She’s nearing retirement age now but she is very interested when I am in town because I moved to Alaska, I grew up in Utah, she is always very interested when I am in town to go to her class and teach her class about aviation. And so often I’ll go in there and I’ll teach them about different kinds of clouds or I’ll go in and teach them about an airplane and how it produces lift or something like that. And this is an opportunity for these children, if nothing else, even if it doesn’t become anything else in aviation, it’s an opportunity for them to connect those stem skills that they’re trying to learn to something that is real and practical. So they can latch on pretty well to aviation. I think that’s why a lot of us aviation guys love aviation is because it does connect to so many different interesting areas of life, of knowledge, that it is just this perpetual learning process. John: Absolutely, I think that there are so many opportunities in aviation-related careers, whether it’s weather or aircraft design or robotics, building that Mars spaceship that we’re going to be building, all kinds of opportunities and that time Chris when you showed up in that classroom in Utah, that may have been like it was for me, that first airplane ride, may have been the spark that who knew that 10 years later, that eight-year-old is now 18, graduating from high school and is selected to enter an engineering school and is going to study aeronautical engineering or astronomical engineering and truly will be designing something that will take us places. And so you become, through just, and just, and I’m saying that because it’s not just, but just by visiting a third-grade class, you become an aviation hero. Chris: Yeah. That’s a leap but it’s completely possible in theory. And as I think back through your story and what you’ve talked about today, I think of my neighbor’s dad that had those Estes rockets. I remember him having a Saturn-5 rocket on his desk and it seems like it was years waiting for that thing to get molded because he was a busy guy and I’m sure it actually probably was years for that thing to get finished so we could go launch it. And then the World War II models that we would all do together and the air shows that we would go together. And at that time, I was a little kid, I wasn’t thinking about really airplanes at all, and we had the approach pass to Salk Lake City, they’d go over my head. All of these things, I don’t know how they eventually led into my decision when the lights really did come on where I’m like I’m going to be a pilot but every single one of those little instances, big or small, it could be big instances too, helped. It’s not that we’re trying to obligate people to aviation, it’s just that we’re trying to create the opportunity for them to feel that spark like what you felt, like what I felt, like what many people have felt. We had a guy in our last show that I interviewed and he didn’t feel the spark until he took his first solo flight, but that is when his spark happened, so very interesting. John: Yes, absolutely. And I liken it sometimes Chris that we’re not being, I guess probably an analogy that I would use is that it’s like we’re acquainting something out. It’s not that we’re dragging people kicking and screaming for the airport, we’re just pointing something out to them and today, there are so many other things going on and we’re so excited about what we’re involved with that we’re happy to point things out. And if it connects and it works, great, and if it doesn’t, well, you know what, at least we had the experience, that shared experience of point that out to that person. Chris: So if I can kind of wrap all these thoughts together here to end the show and then get your thoughts on that, is one of the big reasons that I’m involved with SAFE and you know, I’m not yet a flight instructor, I’m currently working on getting there, I’m not necessarily ground instructor, I would consider myself an aviation education, I’m passionate about that, that’s what I’m going to make my life of. But for me, being a pilot isn’t enough at times and a lot of what we’ve been talking about on this podcast goes back to things like evangelizing aviation and sharing aviation and gaining a deeper respect for aviation through different vocations and things of that nature. So when I went in decided to sign up for SAFE, for me I wasn’t approaching it as an instructor that needed improvement or a K-12 teacher whatever it is, there are many different reasons to join SAFE but the reason I did it is because I believe in constant improvement for myself. I believe in sharing aviation. I believe that there are many people out there that would love aviation and so that is why I ended up joining SAFE. So I would just challenge that you listeners out there that have been listening to this and you may not be flight instructors, you may not be aviation educators, if you ever see yourself getting to a place down the road or even very nearly soon down the road where you need some support and you could use some mentoring, you could use affiliation with an organization that is passionate about aviation education, is passionate about that education, all different forms, then SAFE just seems like a no-brainer to me. I mean, gosh, if you approach it from the perspective that with all the sign-up deals that people get by signing up with SAFE, it basically just pays for itself anyway so why the heck not be a part of SAFE. It just makes total sense to me. So I don’t know, what are your thoughts about that John? John: I couldn’t agree more. I talked a little bit about Flying magazine and there are a lot of others, and your point though Chris of your membership fees is almost paid for with its benefits. And you’re actually right, a really good case in point is if any of your listeners are ForeFlight users and are using the IFR portion, that subscription, 150 dollars, if you’re a SAFE member, you get 33% off, that’s 50 dollars, that’s 5 dollars more than your annual membership for SAFE. John: You actually make money by being a SAFE member. And that’s just one of more than 30 opportunities to take advantage of as members of SAFE. And besides that, like you said, it’s a great community of passionate people about sharing aviation and you can’t help but get more passionate, you can’t help but get more enthused when you’re rubbing elbows and talking to these people that has spent maybe their whole lives in aviation education, or like you are just getting started. And they’re here to share that passion with you so yeah, take advantage of that you’ve got. Chris: Great. So we’re up against our time here. I want to get final closing words from you about maybe people that are on the fence about getting to aviation, maybe people that are rusty pilots needing to get back in and get their license again, what’s your encouragement for aviation at large? What’s your spiel? Give it to us. John: I’m smiling if you didn’t hear my voice because I’m thinking my spiel, I’m not sure I have a spiel but I’ve got a heartfelt passion and that is there are lots of reasons why people begin to fly and there are lots of challenges and distractions when sometimes we have to leave fly, but I would say that today, today we are afforded some of the best opportunities to get over challenges. For those of us that have medical challenges, slowly the FAA through some pressure from congress are starting to see the light of some of the reasons to soften requirements of that third class medical, that’s great. Long overdue but it’s coming. There are other ways that flying has gotten a little bit less expensive and I think what we want to do is keep in mind and keep it over in a forefront that while aviation isn’t inexpensive, there are lots of other ways that we go through life. We have adventures, whether it’s going out on a big skiing trip or going a big bass boat, or any of the other things that we might be doing in our recreational lives, flying is right there in class. So I get little disheartened when I hear people say it’s too expensive. What it is is I don’t think we put enough of a value on all the freedoms that we have available to us. Some of those challenges are being knocked down, the big one is the medical, so I think if you haven’t flown in a while, go find a person that’s flying, go for an airplane ride, you know you’re going to get bit again, and it’s going to come rushing back and you’ll want to get back out in it yourself. And it’s like riding a bike. Oh sure you’re not going to be as smooth as you would hope but believe me, I’ve flown with a lot of rusty pilots and have welcomed a lot back to the fold. It’s like riding a bike, you’ll do fine so don’t not go out to the airport. Changes yes, opportunities absolutely. We missed you so come on back, we’ll welcome you at the airport. Chris: Great. That is one of the best answers to that question we’ve ever had so good job. You did have a spiel after all. Alright John, well thanks for joining us on AviatorCast this week. Really appreciate it. We’re excited with what you guys are doing with SAFE. I’ll let the listeners know how they can find you guys and where they can find out more information here after our remarks. So that’s it. Again, thank you so much for joining us. John: Chris it’s been a pleasure. Thanks for having us. I look forward to the next time. Chris: Yep, see you John. *Join us next week for another exciting topic or interview with a great guest. Spread the AviatorCast message. Please review AviatorCast on iTunes or submit an audio question for the show at AviatorCast.com. All iTunes reviews and audio questions that are aired on the show will get an official AviatorCast t-shirt. You can write AviatorCast directly on AviatorCast.com where you can interact with the AviatorCast community or write AviatorCast at me@aviatorcast.com. We’d love to hear from you. Chris: A very, very big thanks and high five to John for joining us on this episode of AviatorCast. John, we really appreciate your insight, your passion, your thoughts and ideas about aviation in general especially when it comes to education. We’re excited about what SAFE is doing and we’re so appreciative taking time out of your busy retirement schedule if you want to call it that to join us here on AviatorCast. Looking forward to seeing you guys at Oshkosh and it will be fantastic to catch up with you. Again, thanks for joining us on the show. So a final shout-out goes out to the Angle of Attack crew for all they do to make this episode of AviatorCast possible. They do so much behind the scenes. You guys have no idea how much they do to make things like this possible where you and I can reconnect every week, reconnect to that passion, that spark for aviation and keep on keeping on. And also thank you to you listeners for joining us on AviatorCast every week. It is your reviews, it is your shares, your likes, all those things, and even just your presence that makes this podcast possible. If it wasn’t for the feedback I get from you guys and from the emails I get from you guys, I wouldn’t be able to continue this, so I really appreciate you being part of this small part of the aviation community here at AviatorCast, I really appreciate it. Week after week, I always look forward to reconnecting with you guys. If you ever want to reach out to me, feel free to do so at me@aviatorcast.com, that would be great, and join us next week for another AviatorCast.